And that’s just the use of the word in the printed text of books, not in everyday conversation or social media where the term has been run over by a snowplow and left for dead. Just watch any Bravo reality television show featuring middle-aged women trying to remain relevant, and you’ll run into no less than four “amazings”. Traditionally, “amazing” was reserved for something more; “amazing” was when one experienced great surprise or wonder; something extraordinary or even breathtaking. That mediocre slice of pizza that cost you $1.75 and you devoured in 8 seconds when you were drunk, hungry and loud? Not amazing. 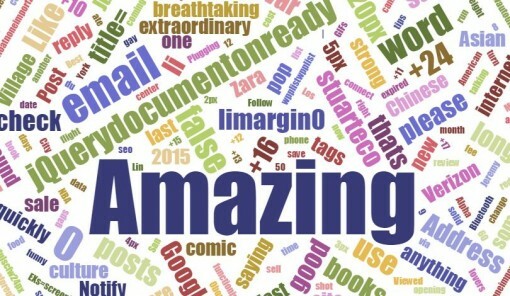 It seems that “amazing” is now being used for any good feeling on the spectrum of good feelings. I’ve heard friends use “amazing” to describe a tasty pasta dish, a customer service experience, abs, a Lifetime movie, a hand-crafted latte… and other non-amazing, everyday nouns. Despite a vocal minority decrying the overuse of the word, pop culture is too strong to overcome by a few sarcastic articles on the internet. A day doesn’t go by without hearing the word at least five times. It’s “amazing” that I don’t have more FOMO listening to you people. Maybe we’re all living really mundane existences or were raised by wolves and just getting assimilated to all the amenities of a modern society… or the word “amazing” is being overused. Always good to see someone else sees this word and understands its ubiquitous vapidity. I sometimes wish I wasn’t so sensitive to the word “amazing” because anytime someone uses the word in casual conversation it stands out like a marquee, bolded and underlined that I sometimes can’t get past my frustration. I believe that only A-holes use the a-word. It shows their lemming-like personality when they use the a-word. Awesome article. But you missed the number one overly misused word in the world over the past 40 years. I have recently vowed to not buy a product or service from any company that uses the a-word in its advertising. Greg, same here. I will immediately down vote product reviews on popular shopping sites that use the word as well. I also do not buy products from advertisers that do this: “INCREDIBLE. UNIQUE. BOLD.” As if a series of verbless sentence fragments with periods between them tricks me into believing how serious they are… To me it’s more of a statement of how unimaginative and uncreative they are. Also, if you all want a fun drinking game, fire up any reality television program, grab a bottle of your favorite hard liquor, and take a swig every time you hear the words “awesome,” “amazing,” or “literally.” If you last through the whole show, you’re not human. people who insist on using this stupid efffing word. using it in conversation.Educated people who don’t know what comes out of their mouths. a refund from the idiot school who educated these zeroes. It’s to the point where I wonder WHEN, not IF, someone will drop the A word in a conversation.